Fruit Fly Ninja traps get rid of fruit flies - and it’s super simple. 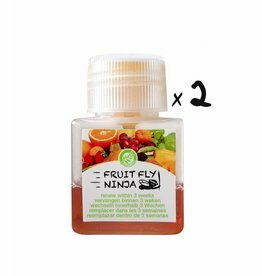 Fruit Fly Ninja will trap the fruit flies before they have the chance to breed. You can change the currency at the top of the page. Hospitality venues can also get our Pro Packs (12 Ninjas) at the following hospitality suppliers. This online store is for consumers and to order test samples. The 1-Pack and 2-Pack are for consumers, retailers can contact us for 1-Packs in bulk. Pricing online is consistently higher than in our retail channels. For hotels, restaurants and green grocers, we have a special Pro Pack containing 12 Ninjas (traps). Our products are made of biodegradable materials and they are natural and non-toxic. Sharing your experience will be very much appreciated. This will allow us to better inform visitors to our website. Placing a review on our Facebook page will only take a minute. Contact us when you're seeking to sell Ninjas in your store.